In current times when so much madness has gripped the society. Parents are killing kids, children are leaving parents and happily moving away without looking back. 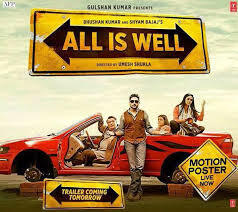 This movie- All is well, is a much apt movie for current times. It has dealt with the sensitive issue of dysfunctional families, estranged father-son relationship. Director Umesh Shukla has done a good job with the plot. 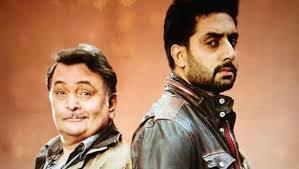 The movie centres around Rishi Kapoor (father) and Abhishek Bachchan (Son). The stories start in Thailand, where Abhishek is shown a struggling musician. He receives a call from India regarding a property issue. To sort out the issues he decide to go back to India after ten years. After reaching India over period of time, he realises, the mess his parents are into. In the process of solving the mess, he faces few uncomfortable truths about his family. He steps back and introspect about his role and realise he has failed his parents badly. But better late than never, and our new age Shravan Kumar decide to put things right. Asin plays the love interest of Abhishek Bachan in the movie. Another loveable character in this film is local money lender Cheema (role played by Zeeshan). He is a don but his comic timings entertain you. Rishi Kapoor character as Mr.Bhalla is very endearing. He plays the role of typical loud Punjabi, one cannot stop laughing at his stubborn attitude. At times one can relate to him and understand the failures and frustration faced by him. Asin’s role is bit cosmetic, but I will not be harsh as the script had restricted scope for her. Supriya Pathak role was bit waste, considering the powerful actress she is. She is playing the role of Alzheimer patient. I liked Abhishek acting, though I wished that more experiment was done with his costume designing. He is a wonderful actor but somehow luck is not on his side. His acting has definitely evolved and the tension scenes between Rishi-Abhishek were the high points of the film. The only troubling point was the mami thing, which could be removed or shortened. This is the second film of Umesh Shukla after Oh My God and I would give him thumbs up. Powerful and fun filled acting of Rishi Kapoor. Definitely for angry young man Abhishek Bachchan. Oh yes, before I forget, I also liked the songs of the movie, they are worth humming. Recipe by Chef Vijay Anand Bakshi, Head of Culinary Operations – Barbeque Nation.